Can you imagine a 128 TB SAS SSD? It is coming soon from Samsung in the familiar 2.5” disk drive package and destined for the next generation of cloud data centres. Leading companies and start-ups from across the storage industry met at this week's Flash Memory Summit in Santa Clara, California. A key takeaway from the event is that solid state storage continues to improve at a rate much faster than networking technologies. Solid state drives surpassed spinning disks in total capacity some time ago - Samsung announced a 16 TB SDD in August 2015 and currently offers a 32 TB SSD, but prices remain high. The market is driven by unrelenting demand for flash drives in laptops, desktops and servers, especially in cloud data centres where there has been an uptick in spending over the last few quarters. NAND prices on a $/GB are significantly higher than they were 12 months. According to data from Objective Analysis, contract prices for NAND averaged $0.30 per gigabyte on July 2nd, compared to $0.20 per gigabyte a year ago. Looking at Amazon.com, the street price of a 500 GB SSD is about the same in mid-2017 as last summer. Meanwhile, with higher prices and relentless demand in the current market, the leading manufacturers of 3D NAND are doing quite well. 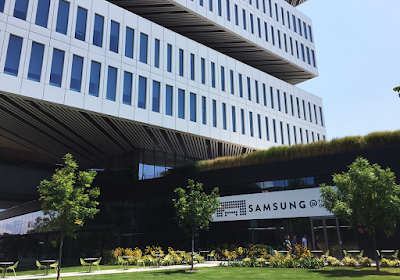 For Samsung Electronics, this translated into very strong revenue and earnings for its June financial report, which predicted that a tight market for DRAM and 3D NAND will continue for the rest of the calendar year. In a presentation at Flash Memory Summit, Jim Handy of Objective Analysis predicted that NAND prices will remain stable at these rates through mid-2018, but will then suddenly collapse due to a saturation of new supply entering the market. His argument goes that all vendors have begun to ship 3D NAND but only in limited volume due to the complexity of mastering 3D NAND manufacturing. Over time, these complexities are being ironed out, manufacturers will move to add additional layers of stacking and the cost per GB will become cheaper for 3D NAND than for 2D planar NAND. Objective Analysis expects a steep oversupply of 3D NAND by late 2018, even before significant new manufacturing facilities in China come online. This year’s Flash Memory Summit was disrupted on opening day by a fire in the exhibition area, apparently an electrical issue at one of the vendor stands. Thankfully no one was hurt, but the exhibits were cancelled for the remainder of the event. Conferences and keynotes were the forum for technological disruptions, of which there are plenty in this rapidly evolving segment. 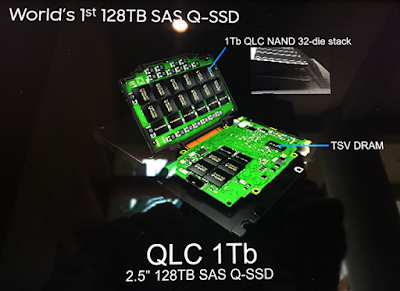 Firstly, Samsung made several important announcements and previewed that massive 128 TB SSD. 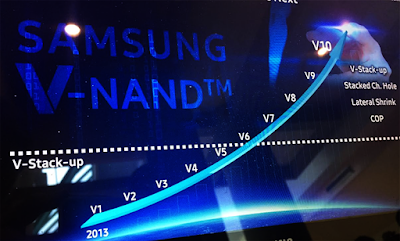 At a fundamental level, Samsung said its 3D NAND roadmap is progressing on schedule. Last year, Samsung introduced its 4th generation, 64-layer triple-level-cell V-NAND flash memory. This has now gone into production and is being used for products such as the 32TB SSD. Drive capacity and performance are expected to scale up with the upcoming v5 generation of 3D NAND. Samsung has already started work on v6 and v7, with an assumed 18-month interval between each generation. Samsung executives seemed confident they will be able to squeeze at least ten generations out of 3D NAND technology, which provide another decade of continuous improvement if Flash SSD. Beyond that, other non-volatile memory technologies will need to be developed. Samsung also announced a 1 TB V-NAND chip, slated for commercial production next year, that will enable 2 TB of memory in a single V-NAND package. This is achieved by stacking 16 x 1 TB dies – an advancement the company considers 'one of the most important memory advances of the past decade'. Samsung is introducing a 16 TB NGSFF (next generation small form factor) SSD that is designed for use in 1U rack servers. Measuring 30.5 x 110 x 4.38 mm, the Samsung NGSFF SSD aims for improved space utilisation and scaling. The company showcased a 1U sample design, codenamed Mission Peak, that pack 36 of the units for a total capacity of 576 TB in the 1 RU appliance. Samsung is looking for partners on this new drive form factor. In addition, for extreme SSD read/write performance, Samsung introduced its first Z-SSD product, boasting 15 microseconds of read latency time, which is approximately a seventh of the read latency of an NVMe SSD. At the application level, the company estimates its Z-SSDs can reduce system response time by up to 12 fold compared to using NVMe SSDs. Samsung is also introducing a technology it calls Key Value SSD. Whereas today's SSDs convert object data of widely ranging sizes into data fragments of a specific size called 'blocks', the new Key Value SSD technology allows SSDs to process data without converting it into blocks. 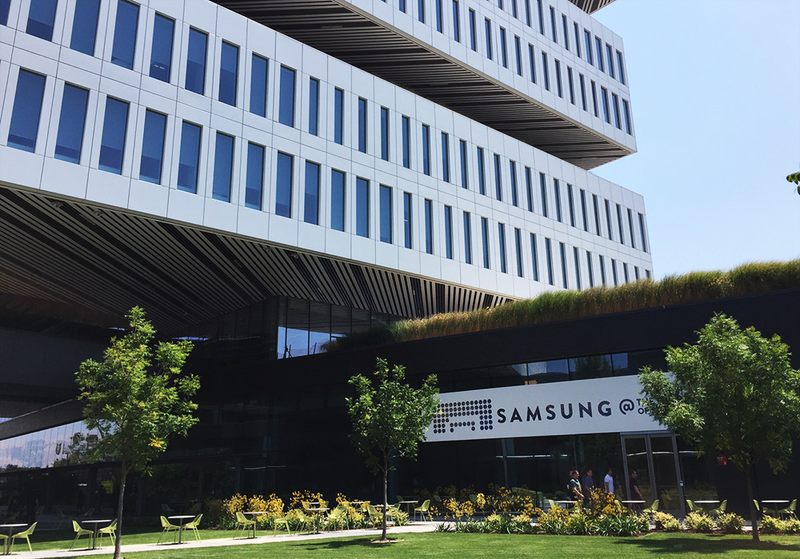 Samsung said its Key Value instead assigns a ‘key’, or specific location, to each value, or piece of object data, regardless of its size. The key enables direct addressing of a data location, which in turn enables the storage to be scaled. After a long dry spell, Orange is growing in its home market of France once again. It has been eight years of steady revenue declines under its new name for the once mighty France Telecom, but finally the Q2 2017 financial reports shows overall growth in France once again. More specifically, the never-ending decline in legacy PSTN services, along with a slight dip in mobile revenues, has finally been offset by growth in FTTH residential broadband services. However, it is too early to say that a corner has been turned and the company's Essentiels2020 strategic plan will be a success. There is fierce competition in the French market in both mobile and broadband services. The company's much touted Orange Money, which has proven to be a successful in the African markets served by the company, has yet to catch hold in Europe. Also, Orange has 95,000 employees in France and substantial social obligations reflecting its long history, giving it the power and burdens of incumbency. Still, the return to growth in Q2 breaks the long chain of down quarters for the company. Overall, Orange reported group revenue of Euro 20.276 billion in the first half of 2017, an increase of 1.1% (Euro 222 million) following an increase of 0.9% in the 2nd half of 2016 (Euro 188 million). Revenue growth accelerated in the 2nd quarter of 2017, rising 1.4% (Euro 138 million) after rising 0.8% in the 1st quarter (Euro 85 million). Orange recorded group operating income of Euro 2.434 billion in the 1st half of 2017, an increase of Euro 293 million compared with the 1st half of 2016. Orange group's capex was Euro 3.276 billion in the 1st half of 2017, up 3.0% on a comparable basis, with capex on the telecom activities (Euro 3.251 billion) up 2.2% while the ratio of capex to revenue for the telecom activities was 16.0% (up 0.2 percentage points compared with the 1st half of 2016). Investments in fibre and very high-speed mobile (4G and 4G+) rose 16.5% compared with the 1st half of 2016, in line with the objectives of the Essentiels2020 strategic plan. The group's fixed broadband base had 19.1 million customers at June 30, 2017 (up 5.4% year on year on a comparable basis). Mobile contracts customers in France and Europe segment had 350,000 net additions in the 2nd quarter of 2017, with the customer base up 3.3% as at June 30, 2017 year on year. 4G in France and in the Europe segment continued its rapid development, rising 39% year on year with 31.6 million customers at June 30, 2017. • Total Q2 revenue in France amounted to Euro 4,452, up 0.5% compared to the same period last year. • Broadband ARPU amounted to euro 33.8, up 1.4%. • Mobile ARPU was euro 21.7, down 0.5%. • Mobile contract net adds amounted to 111,000; churn rate was 11.4%, unchanged from a year ago. • FTTH net adds amounted to 111,000, bringing the installed base to 1.7 million. • ADSL subscriptions dropped by 38,000. • In France, Orange invests more capex (18.1% of revenue) than elsewhere (16.0% overall). In comparison, rival SFR recently reported that it added 330,000 new connections to its fibre network (FTTB/FTTH) in France during Q2. SFR continued to hold the leading position in terms of FTTH subscriptions too with 10 million connections in 1,500 municipalities. On July 12th, Altice-SFR announced an ambitious program in order to accelerate the fibre coverage across the country, aiming to cover 80% of the territory with FTTB/H by 2022 and 100% by 2025. The initiative will rely on private investment without direct public subsidy. Under the plan, Altice-SFR will have its own infrastructure for both very high speed fixed and mobile broadband, reducing its dependence on third parties. In Spain, Orange added 148,000 net mobile contracts, but suffered a churn rate of 18%. The number of 4G customers reached 8.7 million, up 35% over the same period last year. Mobile ARPU stands at Euro 14.2, up 5.9% over last year, but below the European average. Orange had 141,000 net FTTH adds for Q2, but there were 133,000 ADSL deactivations. Orange has more homes within its FTTH footprint in Spain than in France: 10.7 million FTTH connectable homes in Spain (up 28% yr/yr), versus 7.9 million FTTH connectable homes in France (up 34% yr/yr). Orange's momentum in Spain traces back to its 2015 acquisition of Jazztel. A final area worth watching at Orange for the second half of the year is its moves to become a content aggregator. In March, the company announced the formation of Orange Content. It has already signed a number of agreements with prestigious partners, including Canal+, a historic partner, and HBO. Under the first partnership, Orange will distribute a new CANAL+ ESSENTIEL offer to its fibre customers, without commitment and at a competitive price. At present, it appears that Orange will rely on content partnerships rather than acquiring content rights directly, even for football rights or sponsorships with other professional sports. This differs with rival Altice-SFR, which is pursuing sports rights directly and recently acquired exclusive distribution rights for the Champions League and Europa League for the 2018 to 21 seasons. SFR Sport is now also available on Android TV and on connected TVs in its OTT version. As with other telecom operators, exclusive content is now seen as the key to market differentiation and the best chance of reducing customer churn. Fujitsu Network Communications delivers SD-WAN-as-a-Service, a subscription-based SD-WAN managed service, that enables service providers to quickly get to market with an SD-WAN service offering. “Fujitsu’s SD-WAN-as-a-Service uses the MEF’s work defining SD-WAN terminology, fundamental SD-WAN service capabilities and LSO reference architecture. The MEF’s new SD-WAN service work has been quite beneficial in discussions with service & technology providers and end users, says. 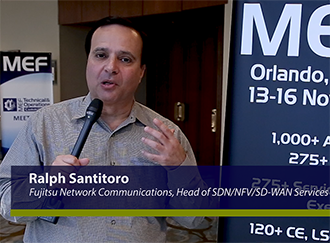 Ralph Santitoro, Head of SDN/NFV/SD-WAN Services at Fujitsu Network Communications. 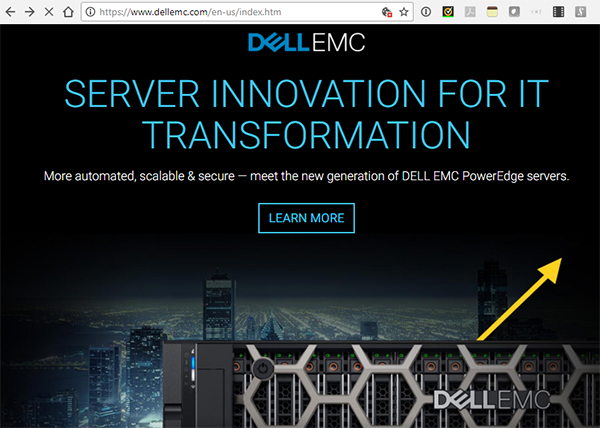 BT is evaluating the performance of Dell EMC disaggregated switches against traditional integrated switching hardware to test the performance, economics and programmability of this new, virtualized approach, which is important as customers increasingly require more flexible, agile networks. The proof-of-concept is running at BT Labs in Adastral Park, Suffolk. 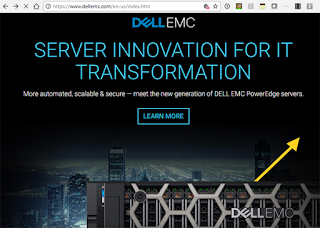 Dell EMC said disaggregated switches have several potential advantages over traditional network switches, as they can be managed flexibly using Netconf protocol and YANG models. This makes the entire system inherently programmable and allows the switches to be operated in concert to spin up new network services or make configuration changes rapidly. BT and Dell EMC are evaluating a number of potential use cases as part of the trial, including instant activation of Ethernet circuits from a third party (such as an enterprise), and the ability of the system to deliver real-time network operational data. The platform also has the potential to deliver other programmable use cases such as bandwidth calendaring – flexing the bandwidth of an Ethernet circuit according to customer need via a predetermined calendar – and delivering network telemetry data to third parties automatically. 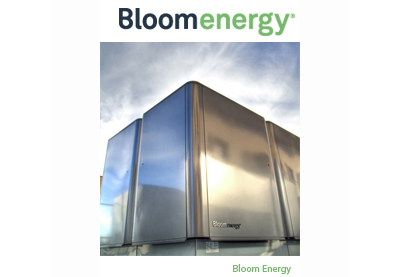 Equinix will deploy Bloom Energy fuel cells at 12 International Business Exchange (IBX) data centers in the U.S. The installation is provided under a 15-year Power Purchase Agreement (PPA) between a subsidiary of Southern Company and Equinix. The project will provide a total capacity of more than 37 megawatts of power with a phased installation that begins in late 2017 through 2019. Equinix said the new fuel cells will be installed at seven of its data centers in the Silicon Valley (SV1, SV2, SV3, SV4, SV5, SV6, SV10), three in the New York area (NY2, NY4, NY5) and two in the Los Angeles area (LA3, LA4). It builds on the pilot program at Equinix's Silicon Valley SV5 IBX data center that began in 2015. "As Equinix data centers, and the interconnection they facilitate, become increasingly critical to the infrastructure of our digital world, this fuel cell expansion is one step in lessening the overall impact of the digital economy on the planet. It enables us to serve our customers with the highest levels of performance while assisting their efforts to make their supply chain clean and efficient," stated Karl Strohmeyer, President, Americas, Equinix. Comcast completed its nationwide rollout of Xfinity Mobile across all of its sales channels in all of its markets. Xfinity Mobile is a new wireless service that combines its partner's (Verizon) 4g LTE network with its own Wi-Fi network of more than 18 million hotspots. Comcast estimates that nearly 70% of customers will connect to the Wi-Fi hotspots when they are on the go. "We created a unique mobile experience that’s simple and saves customers money by connecting to our nationwide Wi-Fi network, and allows them to only pay for the data they use," said Greg Butz, president of Xfinity Mobile. "Now that we’re available across all of our distribution platforms, including our retail locations in all of our markets, we look forward to introducing even more customers to Xfinity Mobile." Unlimited – $45 per month, per line on up to five lines with no usage limits. By the Gig – $12 per GB of shared cellular data across all lines on an account each month. The majority of customers are choosing this option. Consolidated Smart Systems, one of the largest private broadband providers in California, has selected Zayo for a dark fiber solution to enhance and expand their broadband service capabilities to multiple dwelling unit (MDU) communities in Southern California. 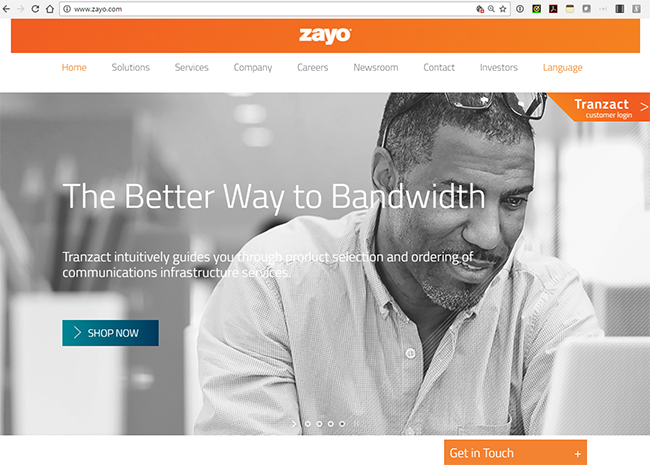 The deal will expand Zayo’s existing fiber footprint in the Los Angeles metro area. Financial terms were not disclosed. Zayo will provide approximately 190 miles of dark fiber, which includes existing network and new build. Zayo will manage the infrastructure, providing a private dedicated network (PDN) that will start with 10G Ethernet services to each location. 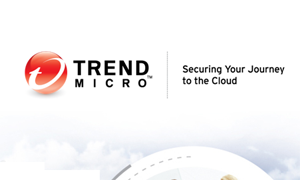 Trend Micro is now offering its Deep Security agent in the recently launched Amazon Web Services (AWS) GovCloud Marketplace. Trend Micro said its Deep Security provides cloud protection from a single agent that scales seamlessly, helping government organizations maintain continuous compliance. .